Guwahati: He gave up everything in life for the sake of Sukananni Ojapali, a folk dance drama of Assam. His life-long devotion enabled the dance drama survive the test of time. Now, at the age of 90, Sangeet Natak Akademi awardee Lalit Chandra Nath Ojha is hopeful of seeing the dance drama going global. And he is ready to go to any extent to make it a reality. 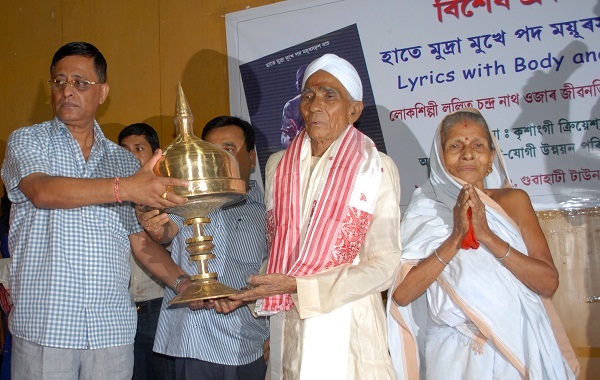 Here, noted filmmaker Prabin Hazarika and senior journalist Manoj Kumar Nath tried to make his efforts known to all via a documentary film – Haate Mudra Mukhe Pod Mayursodrix Nach (Lyrics with Body and Soul). The 64-minute documentary traces the struggles of the veteran exponent of the folk form of dance drama, which is an integral part of Darrang district. “With globalisation, we seem to have forgotten our own identity. It is a crisis situation, and we need to rethink this. We have tried a bit in this regard,” said Prabin Hazarika, who has directed the documentary. Born to a poor family of Sipajhar in Drrang district in 1923, Ojha was always drawn towards this folk form whenever he saw it in his neighbourhood. He lost his father at a very young age and saw his mother struggling hard to meet ends. He grew up seeing the tears of his mother and brothers. “But nothing could separate him from his first love. He went to the neighbourhood agriculture fields to earn livelihood, but amidst the penury he learnt the craft of Sukananni Ojapali,” said Akhim Kumar Nath, assistant director and researcher of the documentary. In spite of all the hardship in life, he continued to spread the form of dance drama at various places. He also performed in New Delhi in front of then Prime Minister Jawaharlal Nehru. Those moments encouraged him to go for the cause, as Ojha is seen saying in the documentary. His effort was recognised at the national level twice – in 1983 he was awarded the prestigious Sangeet Natak Akademi award and again in 2012 the same organisation honoured him with the Rabindranath Tagore award. But unfortunately, the state government so far has not done anything remarkable to encourage him. “It’s unfortunate. But he never hankers after money, fame or anything,” said the assistant director. The veteran dance exponent, who was present during the screening of the documentary here on Sunday, is hopeful that such efforts would help in spreading the awareness about the dance form. “It hurts to see the youngsters giving more importance to materialism,” he rued. “I’m always hopeful to see it going global. Whatever has happened is because of people. I’m just an illiterate Ojha. I do it because I just love doing it,” he said.